And now Marx stands liberated in India following the defeat of the Marxist regime in West Bengal after 34 years in power. Judging by the overwhelming reaction to the assembly elections in West Bengal, it is a moment of deliverance not only for Marx, but also for the people of the eastern Indian state. For 34 years, Marxist ideology kept the state caged in as the winds of change blew across the rest of India. The communist cadres in the state, meanwhile, had become coercive and alienated from the masses and intellectuals who once formed the backbone of the Left. It’s this disconnect that took Marxists in West Bengal away from the people, reflected most clearly in the way land was brutally acquired from the poor for industrial development. Banerjee therefore seems like a saviour to many, rescuing farmers and workers from the highhandedness of the Communist Party of India (Marxist) or CPI(M). She represents a new Left, without the pretensions and ideology of the old. I was in West Bengal during the elections, and although the state doesn’t suffer from hunger and malnutrition, it’s clear the people long for progress. Many I spoke to told me, for example, how they wanted to move beyond the small land holdings they received following the land reforms in the 1970s and 1980s under the Left front government. Yet, no major new industries have come to the state in the last few decades, while many existing ones have shut down. The firms that remain aren’t able to accommodate the state’s rising population and aspirations. It wasn’t just in West Bengal that the communists got a shock—the Left also lost the crucial state of Kerala, although its performance there was better than expected. Meanwhile, if the communist ideology took a beating in West Bengal and Kerala, the Dravidian ideology took a drubbing in the place of its birth, when the anti-Brahminist Dravida Munnetra Kazhagam, or DMK, lost power in Tamil Nadu. The DMK tried hard, like the Left in Bengal and Kerala, to lure voters through ideological appeals. But democracy isn’t shy about taking revenge on those who have betrayed the trust of the people. No amount of handouts in the form of cheap rice and other gifts could make the masses ignore the large-scale corruption of DMK ministers and their cronies. So the story in India today is not about a ruling Congress Party victory, but the complete electoral marginalization of the mainstream Left in India. 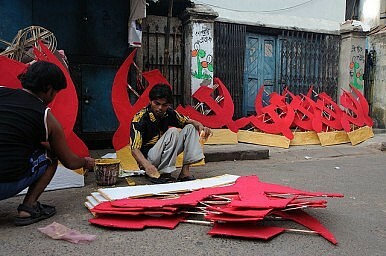 The Communist Party of India was the second-largest grouping in India after independence, but today, the Left in India is in retreat despite many people around the world looking at Marxist doctrine to help them make sense of the change and upheaval prompted by capitalism. The arrogance of power blinded the communist parties to basic Marxist thinking over the inevitability of change—Marx should be seen less as an ideology, and more a way of thinking that evolves with time. Banerjee has done leftists a favour by freeing the cause from India’s Left.